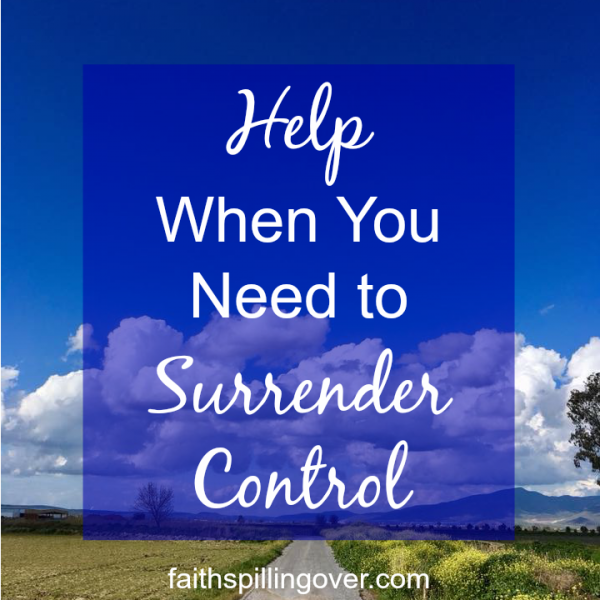 I’m a woman with micromanaging tendencies who knows she should trust God more and surrender control to Him. I have that “Be still and know that I am God” verse memorized, but I’m bad at it. I can barely sit still, and I’m terrible at resting! I can’t even sit down and watch a movie in my living room without getting up 10 times to find a better pillow, send a text, or make popcorn for everyone. Even when my body tries to sit still, my mind keeps running down its to-do list. When there’s a problem, I wonder what I might do to solve it. I’m hope I can make it okay with just the right effort, just the right words, or just the right phone call. Maybe if I pray just the right prayer, I can get God to do what I’m expecting He’ll do? And even when I know I can’t solve it, I worry about it. How can a ready-to-take-charge woman learn to lay down worry and surrender control? Eight little words, and two big steps. But what do they mean? On one hand I understand the words perfectly: Be still and chill. (I love that those words rhyme.) Calm down a moment; sit and just breathe. But it’s one thing to still your body and another to calm your troubled, fretting mind. My own striving to handle a problem. A responsibility or activity God didn’t call me to. 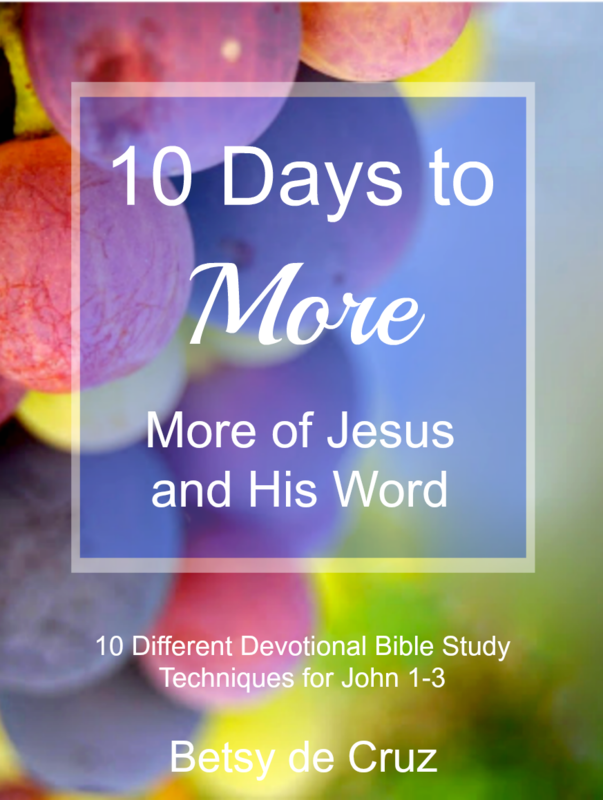 What does it mean to Know He is God? Psalm 46 mentions several of God’s important characteristics. As we remember and acknowledge God’s greatness, we find new grace to surrender our worries and anxious thoughts into His loving hands. Maybe you need a reminder of these truths too? “God is our refuge and strength…” (v. 1a) No matter what you’re facing today, friend, in God you have a refuge and a resting place. He will give you the strength you need. “…An ever-present help in trouble.” (v. 1b) When trouble knocks at the door, you have an ever-present Helper. You will never face a situation God can’t help you through. “The Lord Almighty is with us; the God of Jacob is our fortress.” (v. 7) You are never alone. The same God who was with Abraham, Jacob, Moses, and Joshua is with you today. As we remember God’s greatness, we find new grace to surrender our worries into His loving hands. If you’re worn out from striving and worry, how about taking a few minutes to be still? Set a timer if it helps. Spend a few moments in prayer to surrender all that worries you into God’s loving care. There is no situation God can’t help you through. No problem He can’t show you how to solve, and no need He can’t supply. No loss He can’t fill. No grief He doesn’t know, and no hurt He can’t heal. How about letting go of control and letting God care for you today? 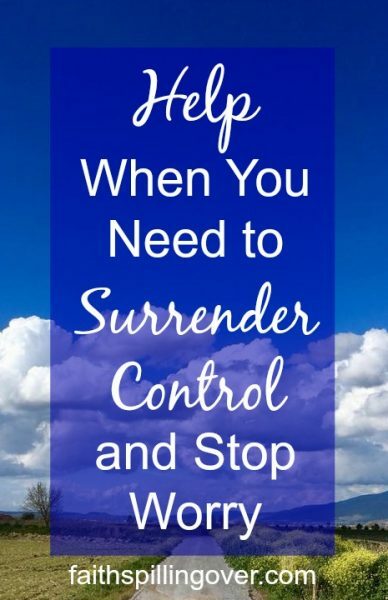 Read Psalm 46 and write down v. 10 Then ask God to show you what you need to let go of and help you to surrender control of those things into His loving care. Make a list of everything that comes to mind and drop each care or worry into His hands. 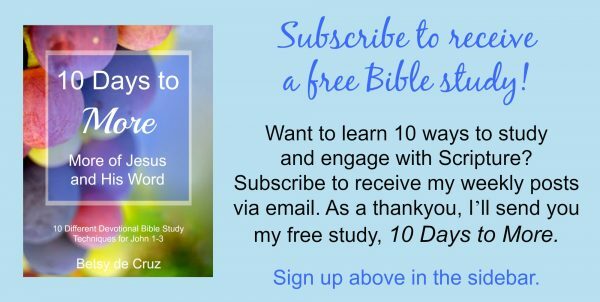 Follow this link to find me on Facebook for daily encouragement and a quick weekly video. 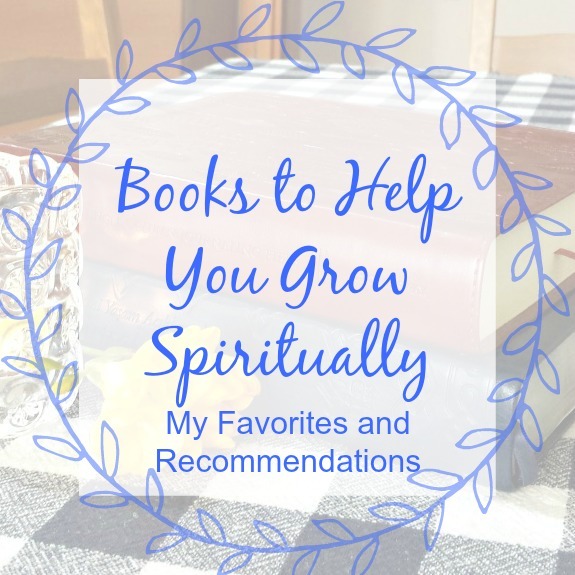 Linking up with Kelly Balarie’s #RaRa Linkup, Holley Gerth’s Coffee for your Heart, Crystal Storms’ #HeartEncouragement, Lyli Dunbar’s #FaithonFire, and Arabah Joy’s Grace and Truth. 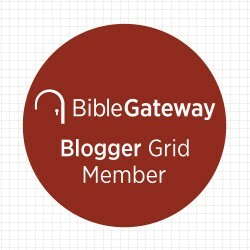 Check out these communities for more encouragement. Betsy, this was so good and timely for me. I am terrible at this as well, but the question, “What do I need to let go of?” is just what I need to ask. Thank you! Praying for you as you settle into the U.S. I also struggle with being still but is amazing when we do manage to surrender our worries to God. These are some great tips! Wow. God’s timing is perfect, Betsy! I was in the midst of trying to “fix or improve” something today when I needed to be still and let God work. Thank you for sharing this Biblical wisdom. Your honesty in your writing is such an encouragement. I chuckle when I read about your difficulty being still. I have to try and calm my brain from jumping from one thing to the other. ( It’s is even worse at night when I go to sleep!) With God’s help, I’m getting better. I’m glad to hear you and family returned home safely. I hope you have a wonderful week and may God continue to bless you and yours. I know what you mean about that tendency to have your brain go into overdrive when it’s bedtime! I read a prayer this morning that encouraged me (from Kaylene Yoder). Something like, Lord, be my strength in the morning and my peace in the evening. Thanks, Kristi. Let’s be still and chill. Thank you, Betsy for your encouraging words. I really needed this as I’m going through a tough time and trying to hold my family together. Bless you! Praying for you now, Phyllis. May the Lord hold your family in His hands. Great post, Betsy! I can sure identify with you. 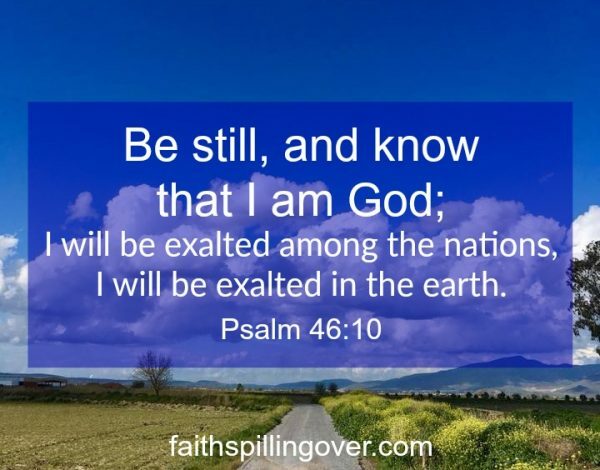 ” I can’t even sit down and watch a movie in my living room without getting up 10 times to find a better pillow, send a text, or make popcorn for everyone.” My latest post includes part of Psalm 46, too! Taking time to rest is important and remembering that we don’t have to solve everything. Sometimes it’s hard to release that control, but when we do there is peace for our souls. Blessings to you! I’m your neighbor at #Let’sHaveCoffee. Thanks so much for dropping by here today, Gayl. Yes, I’m discovering all over again the importance of rest. We have to “let go” to do that, don’t we? So good to know I’m not alone, Karen. (At being “bad at it.”) I have a feeling we’re in good company. Thanks for reading. Thanks,Linda! I do crave that invitation. So grateful He loves and accepts me in Christ. As I am reading your post I trying to solve a few problems of my own. You sound just like me. I used to love the commercials on tv because every one I would jump up and get something done. Now we watch tv with no commercials, and my family loves it. They turn the light out so I can’t work on things at the same time. Be still…. is my life verse. I loved your breakdown of it. Ha! Maree, I’m another one that would jump up during commercials and get stuff done. I know how that is. May the Lord bless you as you seek ways to apply that life verse. It’s a great verse!